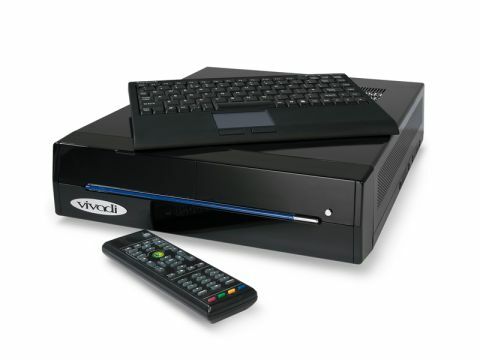 Vivadi is hoping to entice punters who want a multiroom entertainment system at an affordable price. The latest unit in its range of network media servers and clients is the MM320. It's a Media Center PC equipped with a 1TB hard-disk drive and a Blu-ray player, and it's styled to look like a piece of AV kit. As such, it's dressed in a minimal gloss black finish with a Tron-like blue light flashing across the fascia. Some sort of LED display or a few controls on the front might have been more helpful, though. The HDMI makes it easy to connect to a TV and carries 1080p/24 Blu-ray pictures, but it doesn't support HD audio bitstream output. Instead Dolby True HD and DTS HD Master Audio are converted to PCM, which shouldn't be an issue for any HDMI-equipped receiver. Using the Ethernet port Vivadi can fit out your home with a full multi-room system, with the MediaServer unit at its heart and up to 20 client units. The MediaServer can be made bespoke (4, 6 and 8TB options are available) priced between £2,500 and £3,500. Downloading BD Live content via the port is supported by ArcSoft's TotalMedia Theater 3, the unit's Blu-ray playback software. The unit is remarkably deep to accommodate the cooling mechanism and various cards and drives. Inside is a dual-core 64-bit, 2 x 3GHz processor with 2GB of RAM, as well as twin Freeview tuners. This makes the PVR highly flexible, and the 1TB HDD can hold around 800hrs of TV recordings. Sweet. The unit runs Windows 7, and digital content is organised by the ubiquitous Media Center that opens when it boots up. The interface is intuitive to use and gorgeous to look at, putting recorded TV shows, music, videos and photos within easy reach. The 14-day EPG makes channel browsing a breeze. The supplied remote helps keep up the AV façade, but sadly, I found it too cluttered. Step out of Media Center and the MM320 offers full PC functions, complete with a KeySonic wireless keyboard. Our test unit came with SlySoft AnyDVD software installed and, although it takes over an hour to rip a Blu-ray disc, the resulting quality is excellent. Likewise Blu-ray pictures from the disc drive deliver scalpel sharp detail, rich, effulgent colours and fluid motion. Subjectively it's as good as any budget to midrange standalone deck. When piped through a decent sound system we can't fault its audio quality. I was also pleased to find that the unit loads discs fairly quickly and runs smoothly even when running other software at the same time. All in all, the MM320 is a decent Media Center PC that boasts a solid range of features, although the spec is a little light compared with MCPCs from rival brands. The slight niggles with Blu-ray processing might put off picture pedants.